My niece Josie (aka- the cutest 2 year old EVER) loves music and is constantly singing. 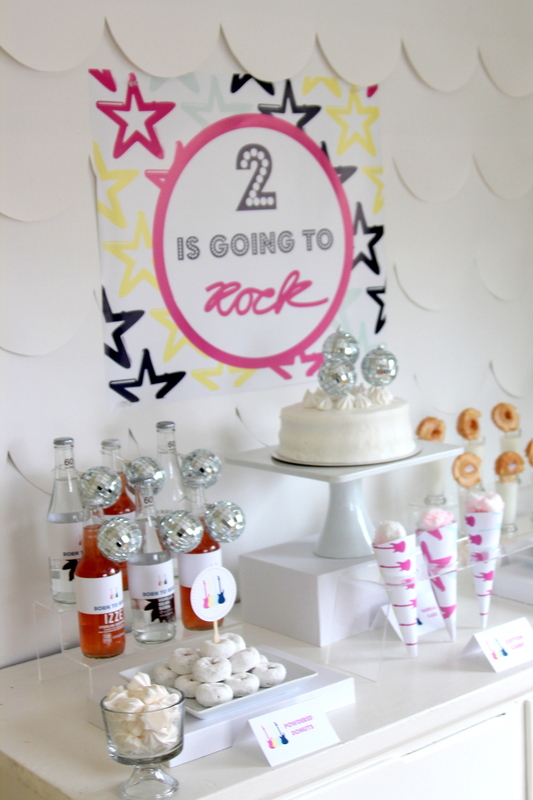 It is darling, and also just begs for a fabulously musical, disco ball studded rock star party, don’t you agree? Guess which aunt was home from Saipan for said birthday party? Yep, this lucky girl right here. 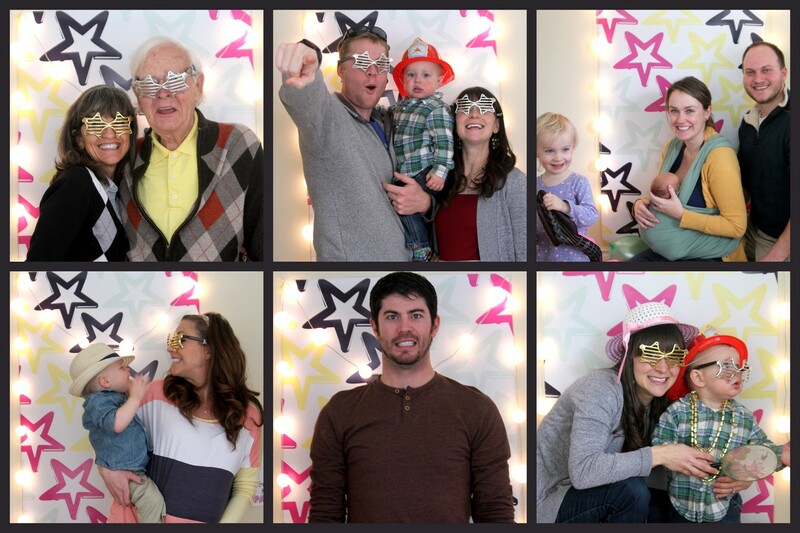 And what a great party to be around for! Since Trish and I didn’t really start working on it until Friday afternoon (the party was Saturday morning), this party falls in the uber-low maintenance category (on the sliding scale of usually-I-underestimate-the-work-involved-by-a lot). 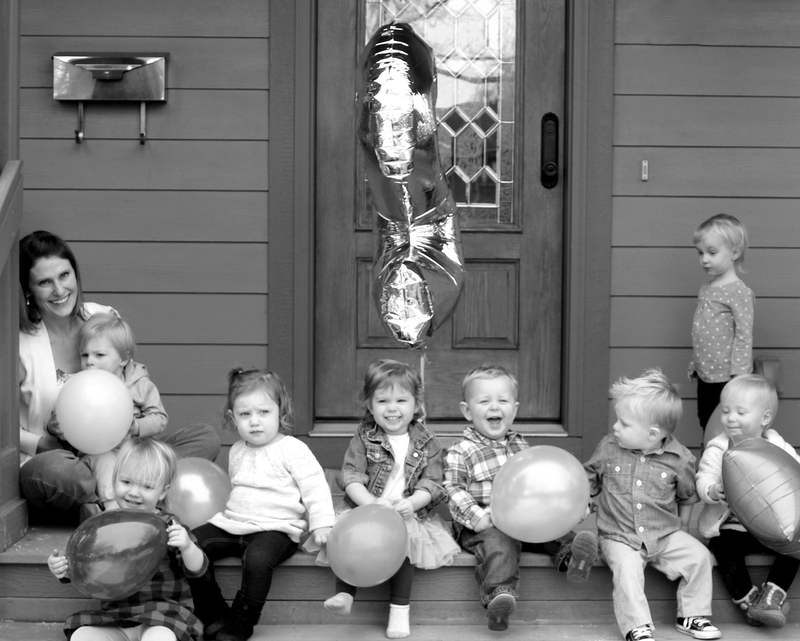 Since Josie’s crew of 2 year old buddies was absolutely enamored with the abundance of balloons, it didn’t take much to party like a rock star. 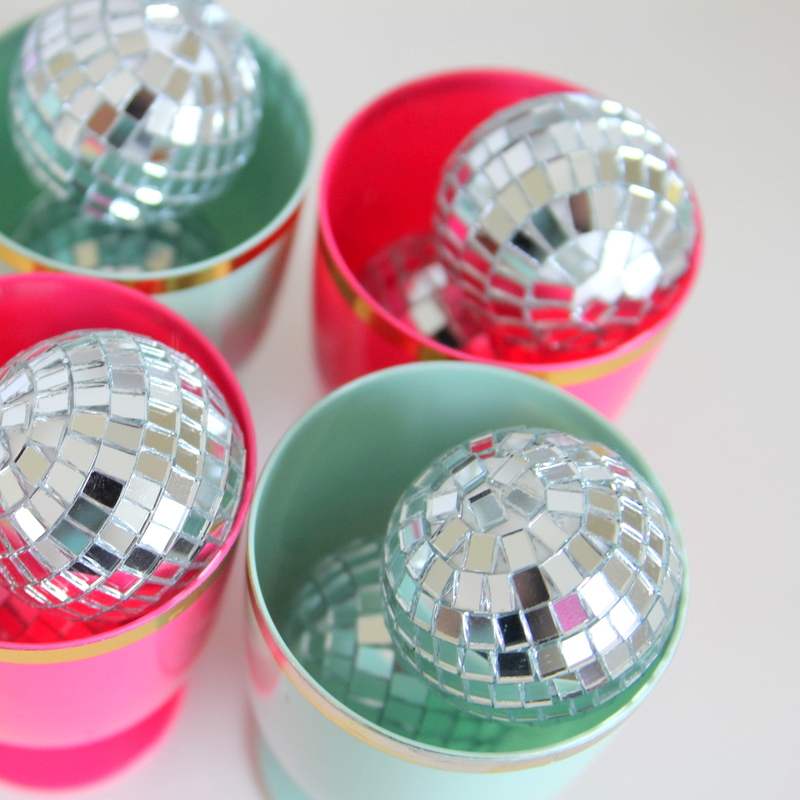 Easy + fun = the best kind of party! 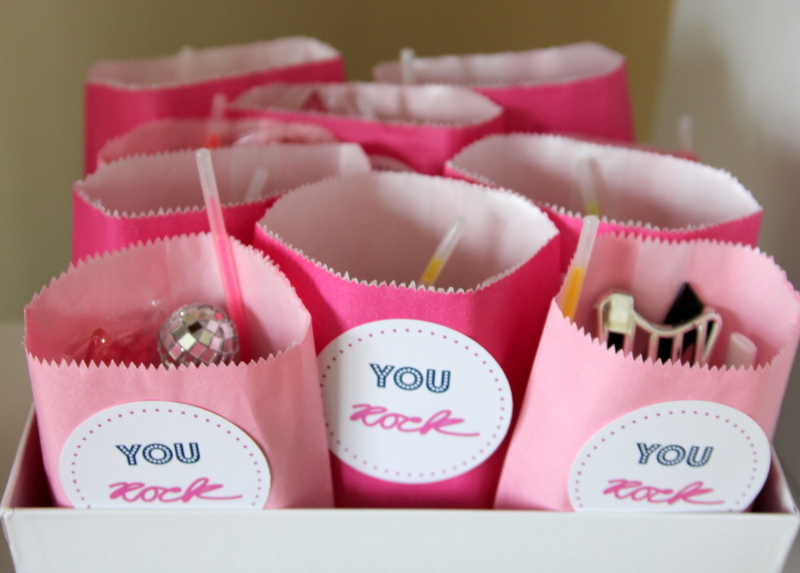 I love brunch parties- brunch menus are easy to put together, yummy, and inexpensive. Win, win, win! 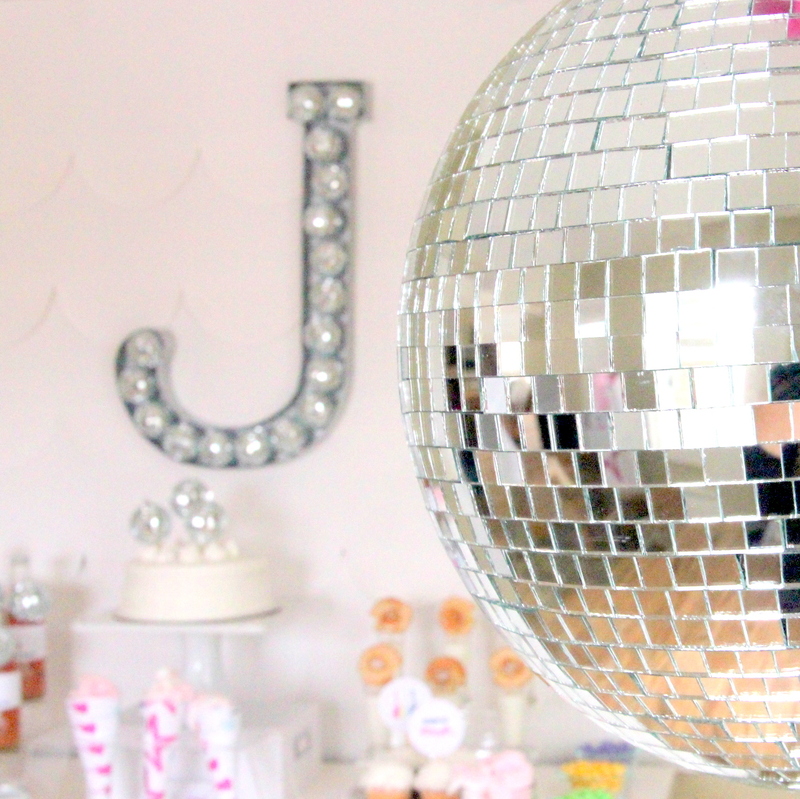 Besides our brunch spread (which I didn’t get a single picture of- haha! 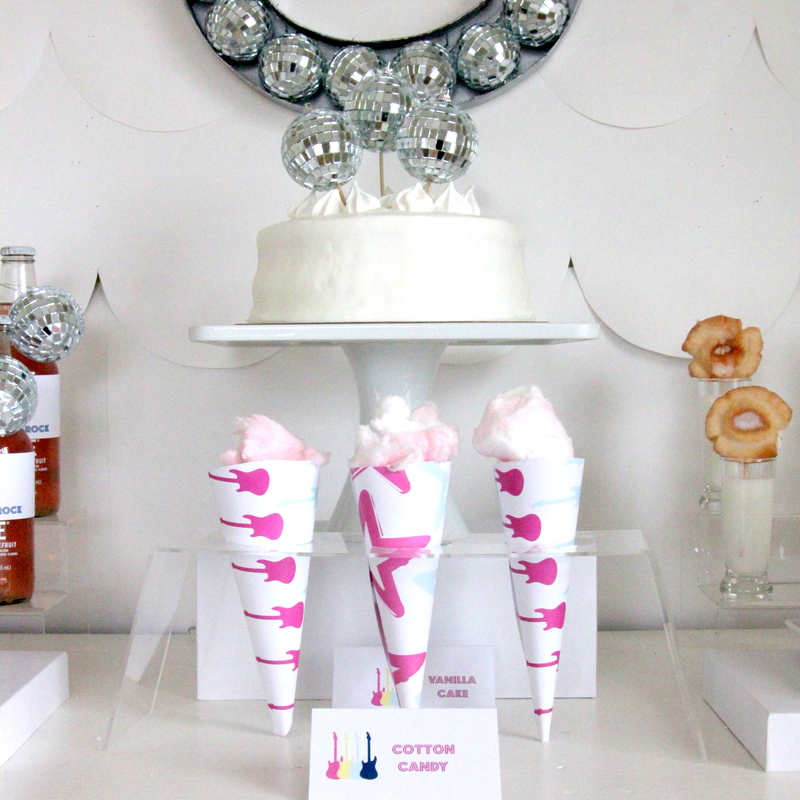 ), we put together a whole table of breakfast-y (and also not-so-brunchy) treats- powdered mini donuts, and milk shot glasses with mini old fashioned donuts, vanilla cake with a disco ball topper, coconut cupcakes, white chocolate M&Ms, and pink cotton candy in cones and in jars. 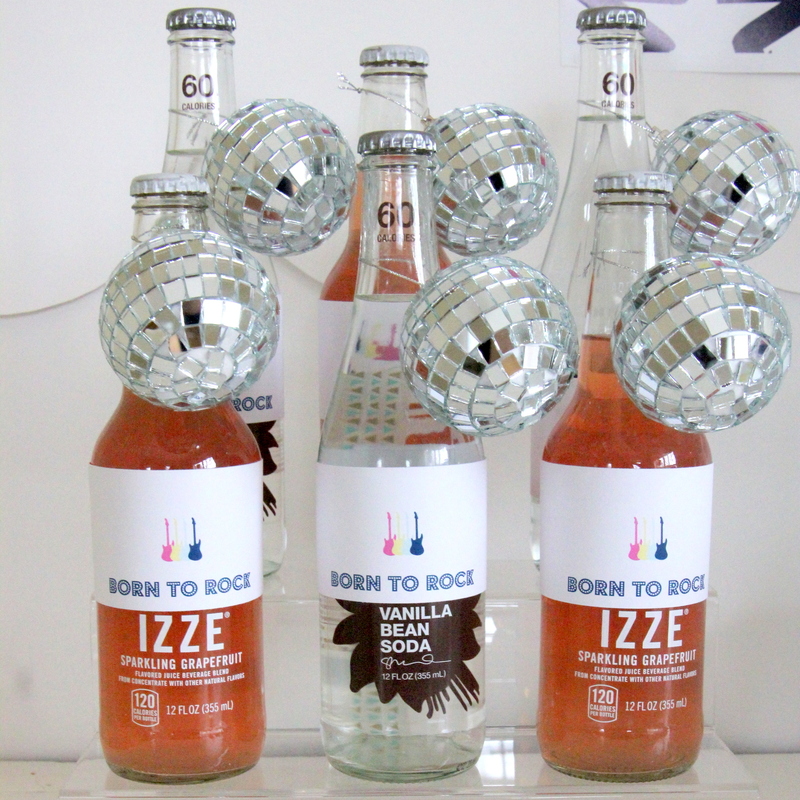 Also, the disco balls and drink wraps on the IZZEs (and other sodas) gave them an extra rock star-y vibe. 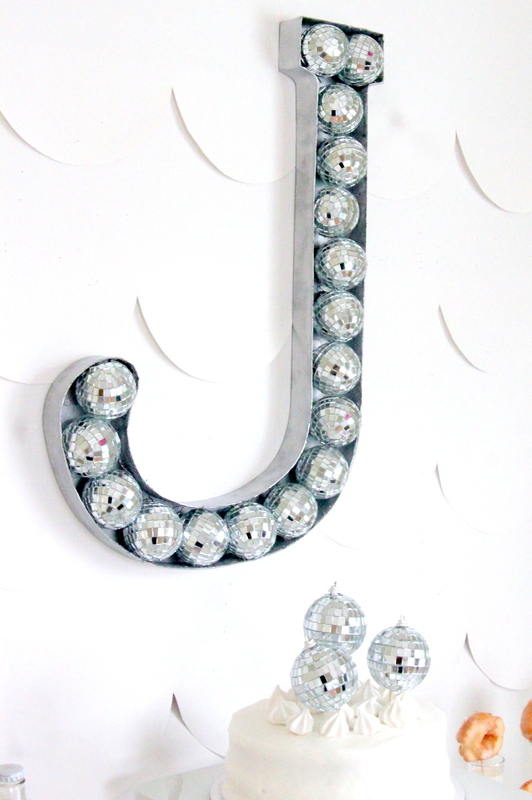 In a word, disco balls. 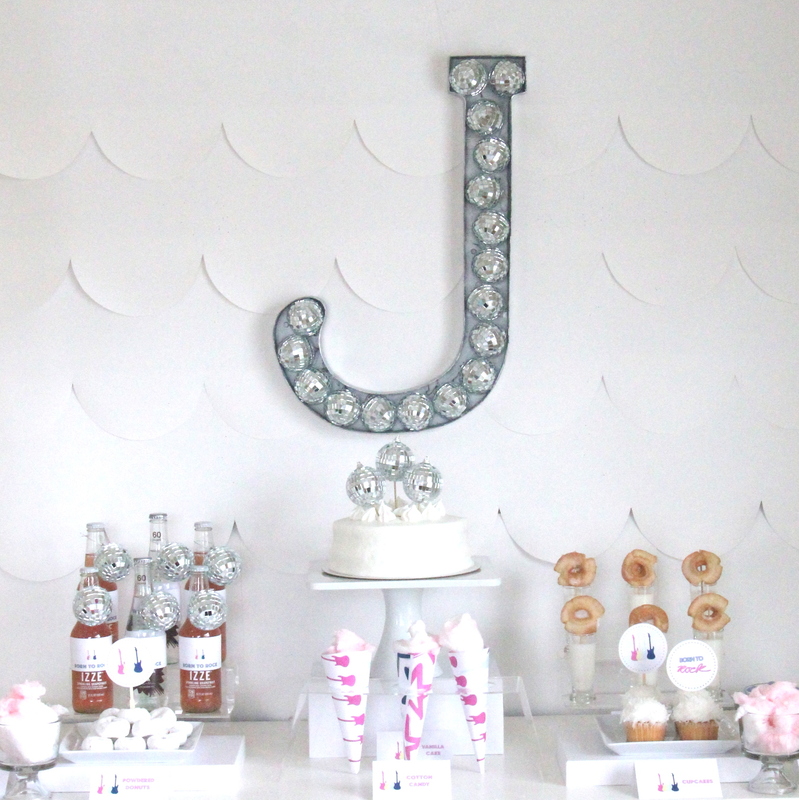 The big hanging disco ball was just the beginning- there were medium and small disco balls everywhere- in monograms, as a cake topper, around drinks, in cups, hanging as garlands. 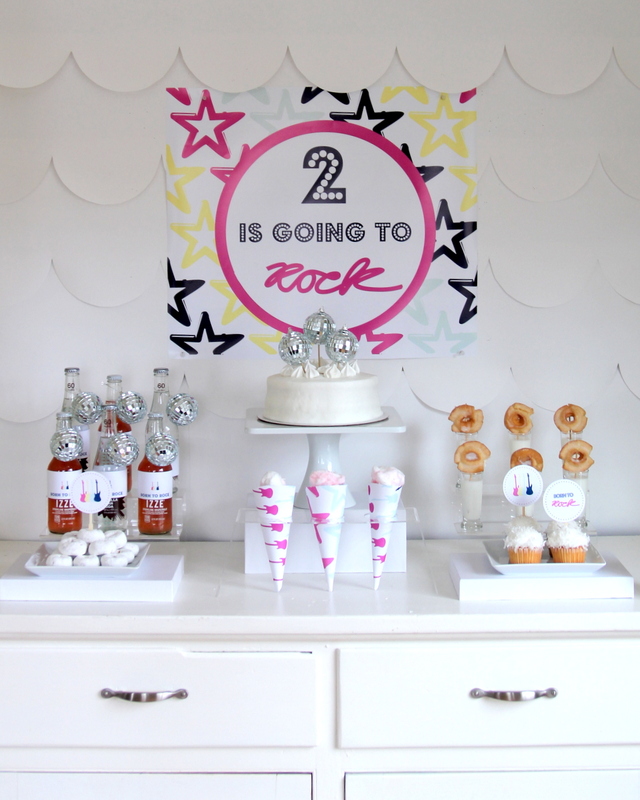 The only other décor we used were printable posters, banners, garlands, buntings , paper cones, favor boxes and labels- both low maintenance and fabulous. I am pretty sure this cardboard market by IKEA is the best $15 I’ve spent in a long time (in fact, I may or may not have spent a decent amount of time trying [unsuccessfully] to figure out how to bring it back to Saipan with me- haha!). 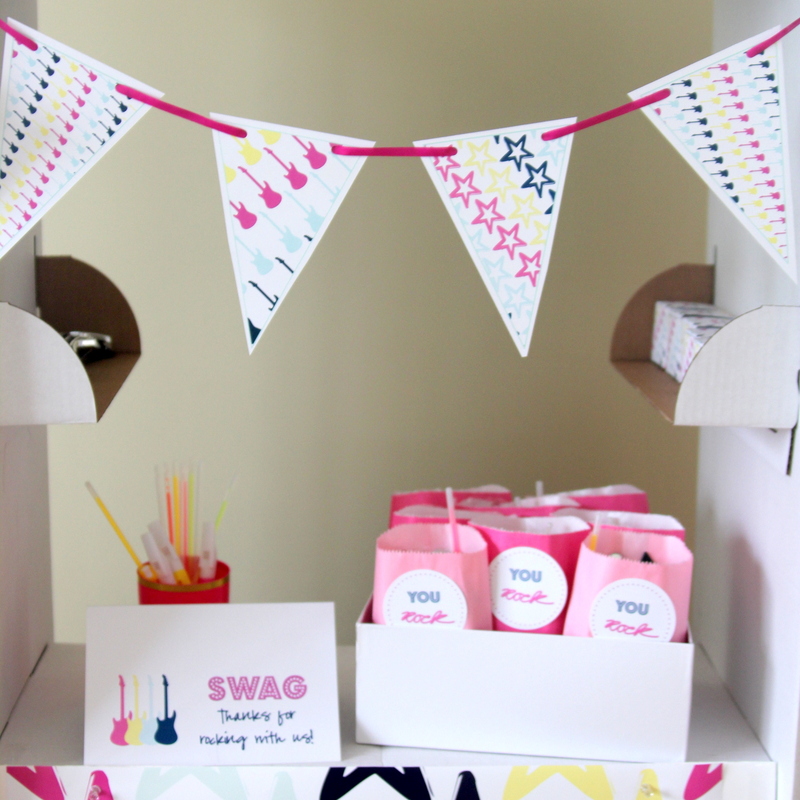 After covering the whole stand with white paper, this little market transformed into a perfectly fabulous swag station. 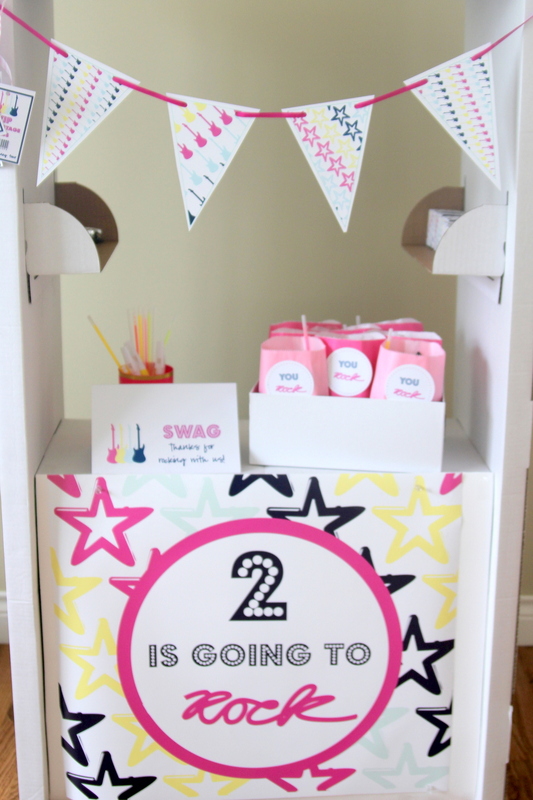 Stocked with glow sticks, mini ornaments, favor boxes filled with mini disco balls, treat bags filled with rock star-ish loot, this swag station was a big attraction for the gaggle of two year old party guests. 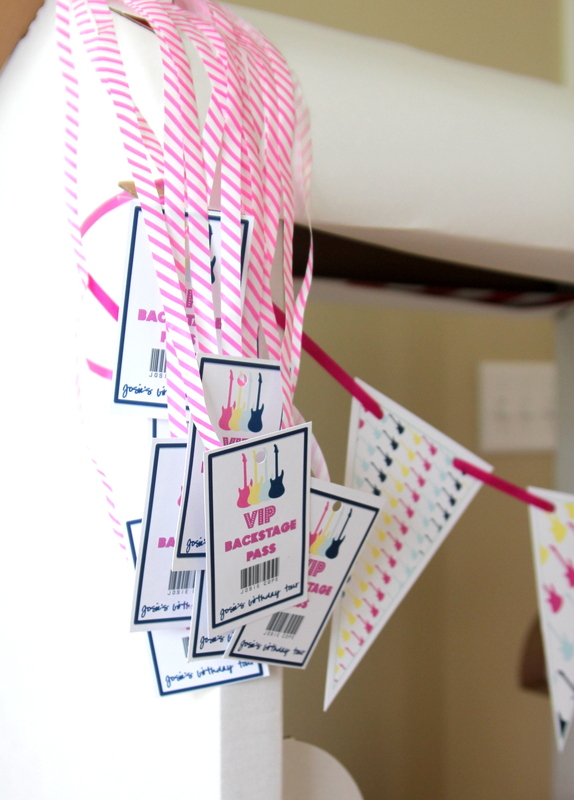 Back stage passes strung on the side proved to be a huge hit as well. 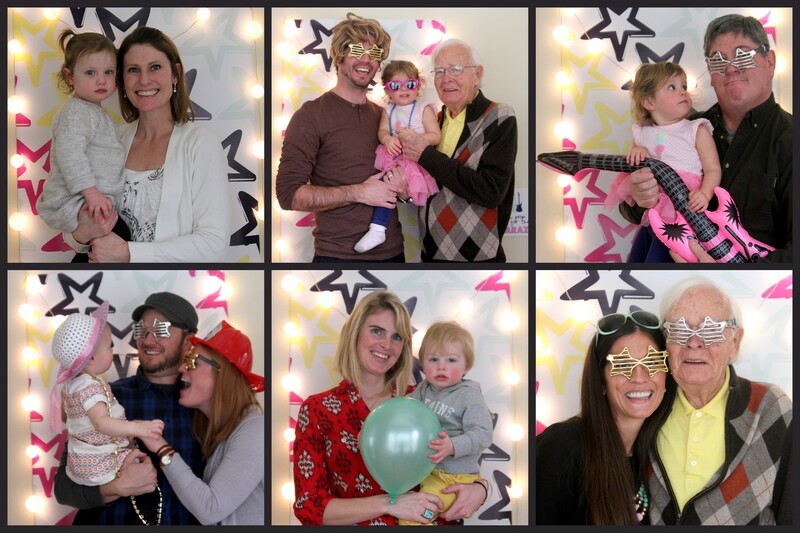 The paparazzi photo booth was a ton of fun during the party, but the real gem is the pictures that came from this little activity. Josie plus my brother in a mullet wig plus my grandpa? Priceless. My dad holding the pink blow up guitar in one hand and Josie on his hip? Instant classic. The aforementioned balloons and swag table also pretty much both count as activities because of the amount of enthusiasm each one generated. 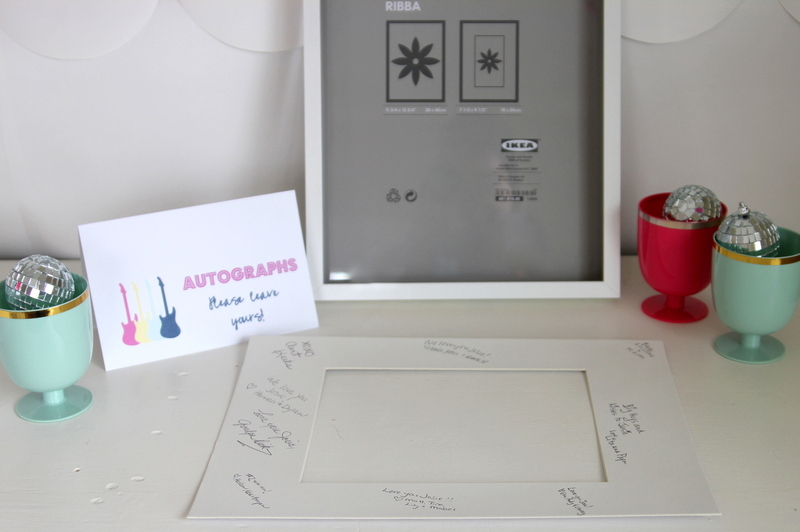 After gathering Josie and her little friends on the porch for a group picture, Trish asked everyone to leave their ‘autograph’ on a frame mat. 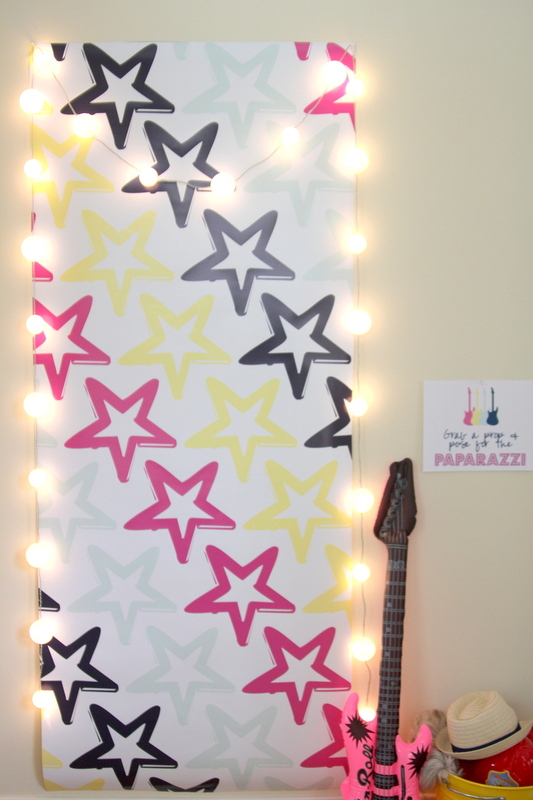 She’s going to use the framed/autographed picture in Josie’s big girl room (cute idea, right?). 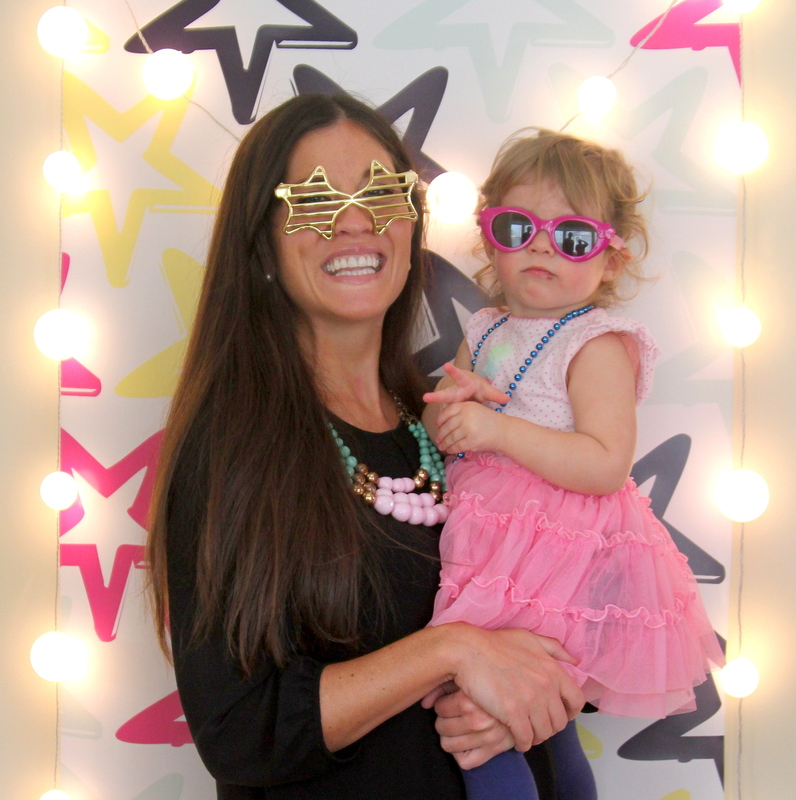 Did I mention how lucky I feel that I got to be in town to party like a rock star with Miss Josie?